MOJAVE, Calif.–The 412th Logistics Readiness Squadron sent out four buses early Oct. 16 to assist the Kern County Sheriff’s Department and California Highway Patrol in transporting motorists who had been trapped in a mudslide on State Route 58 east of Tehachapi. 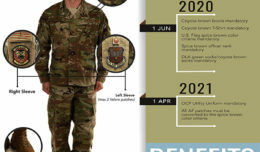 Local authorities contacted Edwards AFB asking for assistance following the mudslide, which occurred during yesterday evening’s heavy rains that affected the Antelope Valley. Many of the motorists either left their cars to be transported to shelters or stayed in their cars overnight. 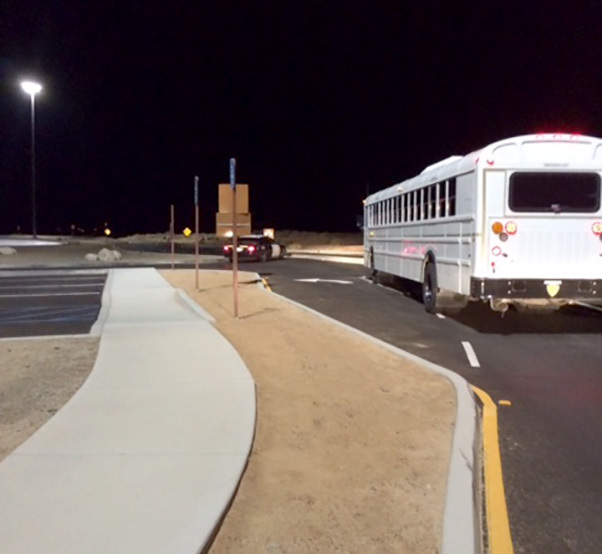 Two Edwards AFB buses driven by Steven Schlecht and James Boyer transported about 75 people to Mojave High School where Kern County Sheriffs Deputies and the Red Cross set up a shelter in one of the buildings. Cots were set up and volunteers helped with taking care of the stranded motorists with first aid and food provided by a local restaurant. An Edwards AFB bus heads out the gate early in the morning escorted by California Highway Patrol Oct. 16. 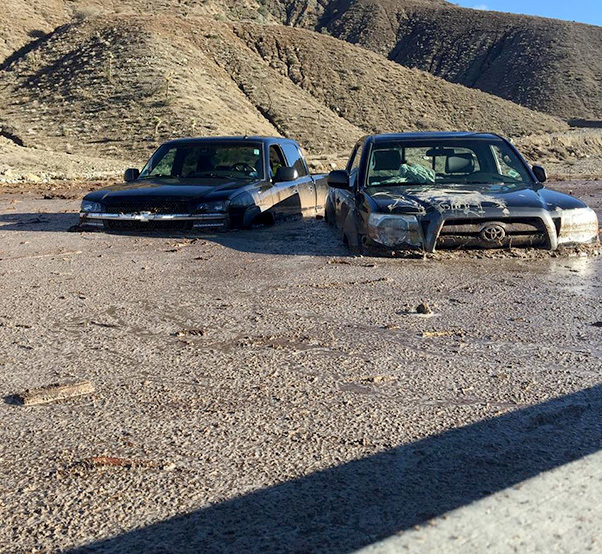 Local authorities contacted the base asking for assistance to help motorists who were stranded by a mudslide on SR 58 east of Tehachapi. Heavy rainstorms hit the Antelope Valley on the evening of Oct. 15 causing mudslides, flooding and road closures. “One of the vehicles trapped in the mud was a tour bus with French tourists,” said Schlecht, 412th LRS Transportation section. Alice Agenbroad and Robert Mejia of 412th LRS piloted two other buses that were stationed at the site of the mudslide in case more evacuations were requested. Multiple mudslides occurred around L.A. County during yesterday’s storm, which hit the Antelope Valley hard resulting in road and freeway closures including the 58 freeway, which borders Edwards AFB. “I got a call about 2 a.m. this morning saying we needed to come to work and help out the sheriffs,” said Juan Lopez, 412th LRS. The section of 58 is expected to be shut down for a few days according to news reports citing the CHP. 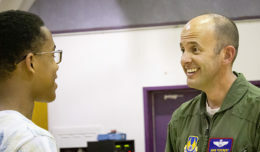 From left to right: Steven Schlecht, James Boyer and Juan Lopez of the 412th Logistics Readiness Squadron, prepare to head back to Edwards AFB following a very early work day where they were called to assist Kern County Sheriff’s Department and California Highway Patrol with transporting stranded motorists to shelters in the local area such as this one at Mojave High School. The motorists became stranded on SR 58 following heavy rainstorms that triggered a mudslide during the evening hours of Oct. 15. 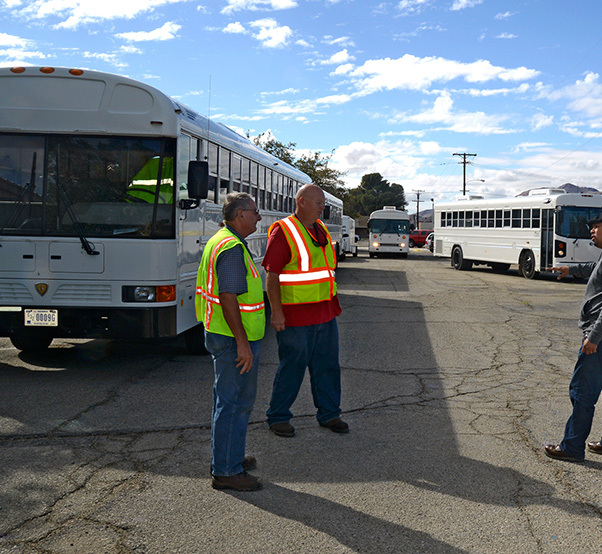 The 412th LRS provided four buses and drivers to help transport victims to local shelters.